Recovery is an important part of any workout or training cycle. Included in the process of recovering from a workout are proper nutrition, sleep, rolling or massage, stretching, compression, and low intensity activity. In particular, with the goal of maximizing the adaptations from a specific workout or in preparing the body to be repaired and fresh enough to take on another effort, you should not overlook nutrition and hydration in the post workout ‘window of opportunity’ when muscles are more apt to accept nutrients. Three main goals of recovery are to restore fluid and electrolyte balance, to replenish muscle and liver glycogen stores, and to stimulate protein synthesis. You can accomplish this by consuming carbohydrates, protein and fluids within thirty to sixty minutes of finishing your workout. Based on research data, athletes are encouraged to utilize this “glycogen window” to restore the muscles. It is particularly important for glycogen-depleting workouts, those that are longer than two hours or those with high intensity efforts, or if the day involves two or three workouts. A carbohydrate to protein ratio of 3 or 4 to 1 has been demonstrated to provide the necessary vehicle1. As sodium helps transport carbohydrates out of the gut and into the bloodstream, including 500 to 700 mg of sodium in addition to approximately 20oz. of water for each lost pound of water weight is also appropriate. Fortunately, most whole foods contain all of the necessary elements to give the body what it requires. In some situations, when food is not available or is unpalatable, a prepackaged fluid source performs the dual role of hydrating and providing necessary nutrients. Many reputable companies have developed balanced recovery drinks in the form of powders or bars that meet recovery needs and are easy to carry in a pocket or mix with water for on the go fueling. Recommended carbohydrate consumption post-workout is based on body weight. Current recommendations are for 1 to 1.2g carbohydrate per kilogram of body weight2. Protein recommendations are based on an absolute amount, 10- to 25 grams3. Many athletes turn to the blender or Vitamix to whip up a well-balanced and tasty recovery drink. Fresh or frozen fruits and vegetables can be supplemented with whey powder, different milks, juices, water, yogurt, nut butters, or even coffee. Wild Maine blueberries are high in a variety of antioxidant nutrients and research shows they improve antioxidant defenses in body systems that need special protection from oxidative stress, including the cardiovascular system4. The recipe below is a great option to get in the carbs and protein you need after a hard workout. A personal favorite of mine is the Peppermint Green Monster smoothie. Sometimes I add a scoop of organic whey powder. Whey is an abundant source of Branched Chain Amino Acids which are used to stimulate protein synthesis. When leucine is ingested in high amounts, such as with whey protein supplementation, there is greater stimulation of protein synthesis, which may speed recovery and adaptation to stress (exercise). Whey has approximately three grams of leucine per serving and the threshold for optimal protein synthesis is three grams. Add in all of the ingredients into a blender and blend until smooth. Adjust to taste and serve with a garnish of chopped dark chocolate and mint leaves. Enjoy with a spoon. Serves 1. 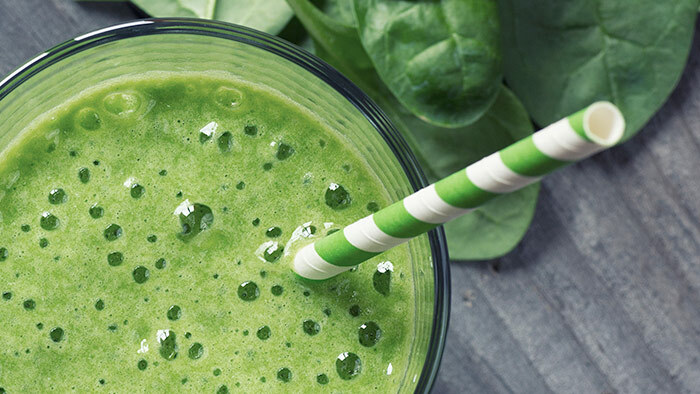 Green smoothie contains approximately 260 calories, 7g fat, 57g carbohydrates, 24g protein, 200mg sodium and significant amounts of Vitamins A and C and Iron. The vegan triathlete is faced with getting carbohydrates and proteins without animal products. Karen, a successful vegan triathlete in New York prefers brown rice and beans with guacamole for recovery from hard races or workouts. Rice, as part of a carbohydrate-rich post workout meal, ensures that your muscles are re-stocked with glycogen. Coupled with beans, rice forms a complete protein, which means it includes all nine essential amino acids the body cannot produce on its own. Include plenty of water to rehydrate. Generally, a recovery meal like this one will be best consumed a couple hours after exercise so start with a rapid replenishment in the 30 minute window after the workout, and plan for a real meal of rice and beans later. Cook the brown rice in a rice steamer or follow package directions. Heat up the oil in a large pan over medium-high heat and fry the onion for 5 minutes. Add the garlic and fry for an additional 5 minutes. Stir in the beans and heat through. Add salt and pepper to taste. Serve with rice. Smash or cube one half an avocado and serve over the rice and beans. Remember, finding some of your favorite ingredients and having them on hand can make quick recovery fuel easy and enjoyable. Experiment, and remember most often, having something is better than nothing so don’t get bogged down in numbers and calories, just eat and drink!